The Dominican Republic weather forecast is one of the most beautiful of all of the Caribbean islands. The latest weather from the Dominican Republic is below. The best things about travelling to the Caribbean islands? That is like asking, "What are the best things about diamonds?" In the Dominican Republic, residents and visitors alike enjoy the nice sunshine and beautiful tropical weather throughout the entire year, making the Dominican Republic the perfect place to take your next Caribbean vaction. The average Dominican Republic weather forecast is a nice comfortable 77°F (25°C). The hottest time of the year is the summer, which lasts from May to October. Average high temperatures hover around about 87°F (30.6°C) during the daytime, while the evenings brings average lows of approximately 72°F (22.2°C). However, it is very humid during the summer months, and the weather in the Dominican Republic can feel quite a bit warmer than the actual temperature. 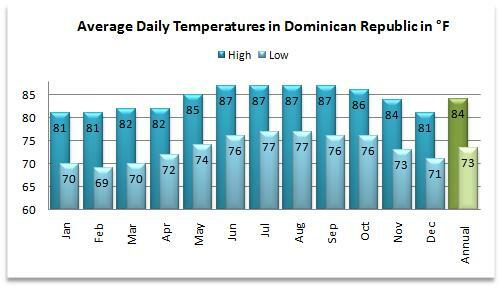 There is very little temperature difference between the summer months and the winter months in the Dominican Republic. From November to April, humidity is lower than the summer months, and it is cooler during the evenings than during the summer evenings. There is also less rain on the island during these months. The rainy season varies on the island. On the northern coast, the wet season is from October to January. There is heavy rain in eastern part of the country during June and November. The southern coast has heavy rain from May through October. Typical of Caribbean islands, there are many unexpected showers in the Dominican Republic on all areas of the island. On average the yearly rainfall about 58.5 inches, with the western part receiving less rain than other parts of the island (similar to the western section of Jamaica). The most rainfall on the island happens during the month of May. The vast majority of showers do not last very long, and quickly give way to the more pleasant sunshine. Dominican Republic weather does have hurricanes. The hurricane season starts at the beginning of June, and continues until the end of November. This island gets its most hurricane activity during the months of August and September. The island is either brushed or hit by a hurricane once every 17 years of so, and receives a direct hit approximately every 4.7 years. The weather is tropical perfection in the Dominican Republic weather forecast!